The Corvette has always been about performance. It has proved to be a worthy machine for dominating at the drag strip, and Corvette Racing has seen continued success with it on the road course. Which is why it’s hard for us to grasp why someone would want to lift one, put knobby off-road tires on it and install a 4×4 drivetrain. This monstrosity showed up at Crusin’ the Coast in Mississippi, according to Corvette Blogger. There isn’t any info as to what is powering the lifted ‘Vette, or what type of chassis its sitting on, but we’ll guess it’s riding on some type of Chevy 4×4 platform from the same time period. The car was for sale for $8000 at the show, which is a bit of a bargain for a well taken care of C3 Corvette such as this. Or, depending on your tastes, it could just be an overpriced eye sore. They may not be everyone, but we’d love to see a 4×4 Corvette doing some actual off-roading. 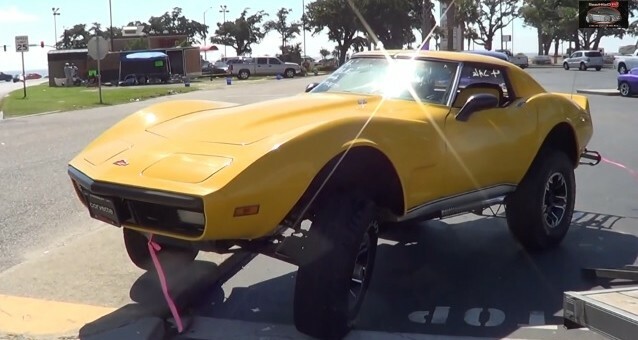 Have a look at the video and tell us what you think about this lifted C3 in the comments below. That just seems like a very bad thing to do to a beautiful car, but that’s just my opinion. I don’t really like C3’s, but this is foolish.